Pack your bags, you are off to Greece! Welcome to Athens! Upon arrival at Eleftherios Venizelos International Airport, you will be greeted by your Hellenic Holidays transfer representative, who will drive you to your hotel. Enjoy the remainder of your day exploring Athens. 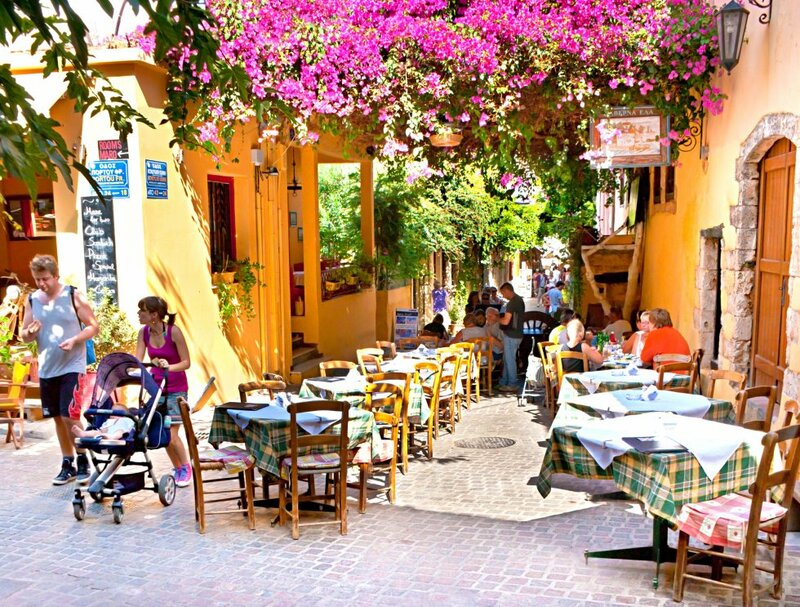 You might stroll the old neighborhoods of Plaka, which mingle old & new Athens or explore the vibrant neighborhoods of Monastiraki & Kolonaki. Be sure to try our amazing restaurant recommendations sampling wonderful Greek cuisine. After breakfast, your day will begin with your private half day walking tour. 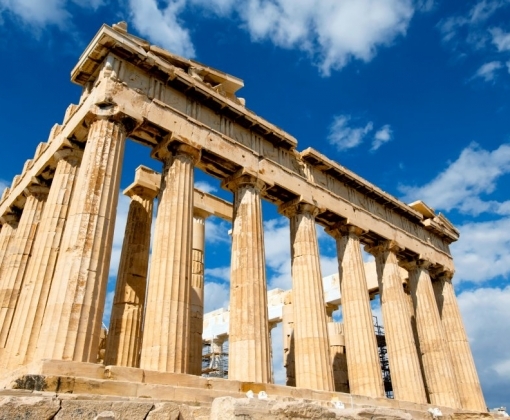 Along with your English speaking licensed guide, you will visit the Acropolis and the awesome temples of the Parthenon, the Erectheion and the Athena Nike. Your walk will continue to the Areopagus, or Hill of Mars. Finally, you pass the Odeon of Herodes Atticus, where you can still enjoy concerts and theatrical performances in the summer months. 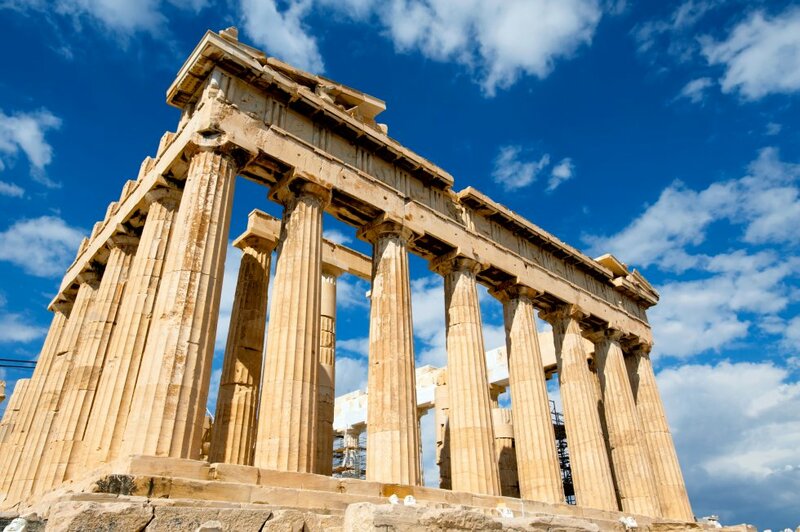 The tour will conclude with a visit to the Acropolis Museum exhibiting the glory of Ancient Athens. After breakfast, your Hellenic Holidays transfer representative, will pick you up from your hotel and drive you to the airport for your short flight to Crete. Upon arrival, you will be greeted and driven to your hotel. Chania is one of those rare cities in Greece, which is a mosaic of cultures, and history. Venetian influences as well as Jewish and Roman are evident through the various neighborhoods of Chania. Enjoy the rest of your day, walking along the cobblestone paths within the castle walls. 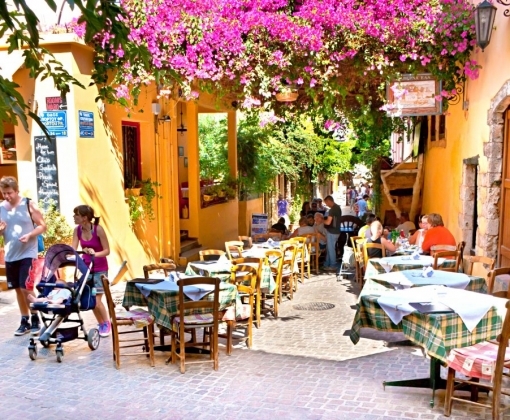 Be sure to try our restaurant recommendations and sample some of Crete’s finest cuisine. Today you will begin your journey through the plateau of Omalos on your way to one of the longest and most impressive of Europe’s limestone gorges. Your hike will last approximately 6 hours and will take you along a breathtaking and constantly changing landscape down to Agia Roumeli, a fishing village by the South Coast accessible only by boat. At the base of the gorge you can enjoy a refreshing swim as well as lunch at one of the local tavernas. After a one hour sail by ferry boat you will return to Sfakia, where your driver will bring you back to the hotel for some well-deserved rest. Your day is at leisure. You might consider a day trip to the Balos Beach lagoon for a day of relaxation. Leaving the port of Kissamos toward Gramvousa exploring the area and then arriving at Balos Beach for a day or swimming in the shallow turquoise waters of the lagoon. Balos Beach is one of the most picturesque and photographed beaches in Greece. Today is your last day in Crete. Consider exploring the eastern side of Crete visiting Heraklion. About 15 minutes from the center of Heraklion, is the archeological site of Knossos and its museum. The ruins of the Minoan Civilization are one of the must-see archaeological sites in Greece. If you enjoy wine, you must visit the Boutari winery, one of the biggest in Greece, for a guided tour and wine tasting. Off to Santorini! 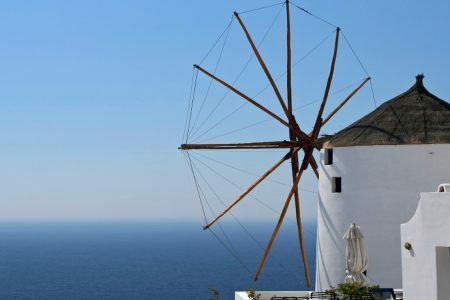 Your Hellenic Holidays transfer representative will drive you to the port of Heraklion where you embark on a 2 hour sail aboard a high speed ferry to Santorini. Santorini is most known for its breathtaking views of the red and brown layers of volcanic ash that makes its famous cliffside. You will be driven to your hotel overlooking the majestic caldera. Spend the rest of the day enjoying the romantic atmosphere of the island. Perched on a cliff with breathtaking views of the sunsets and the sea below creates the perfect setting for the next few days. After breakfast enjoying caldera views, your morning is at leisure. In the early afternoon, you will be driven to the port of Vlihada or Ammoudi where you will embark on the sailing trip that we have arranged. You will sail to the Red and White beaches, the Venetian Lighthouse and the Sulphur Springs. During these visits, you will have the opportunity to swim and snorkel. You will then sail to a secluded bay where while you swim or relax, a lavish steak and seafood barbecue with many appetizers and salads is being prepared for you to enjoy. 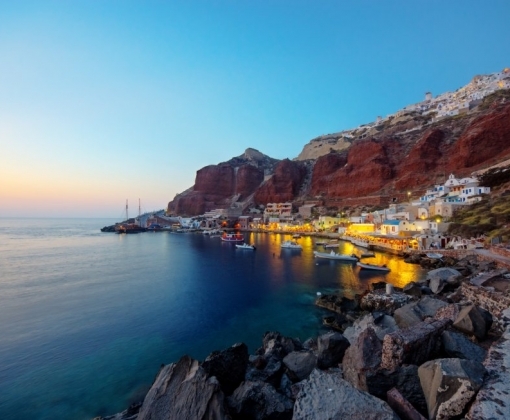 While in Santorini, consider hiking along the cobblestone pathway from Fira to Imerovigli and then on to Oia. You can also take a short ride and visit the archaeological site of Akrotiri, seeing the remnants of this village in its beautiful museum. Wine connoisseurs will enjoy a journey down the Santorini wine circuit through the inland villages of Karterados, Monolithos and Emporio. Your last day in Santorini. 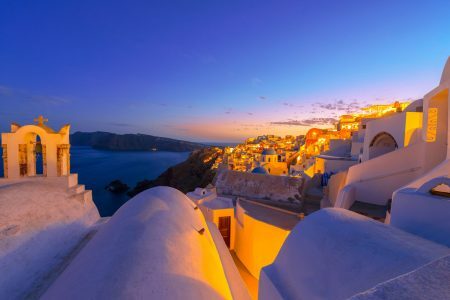 You might consider visiting the famous village of Oia. 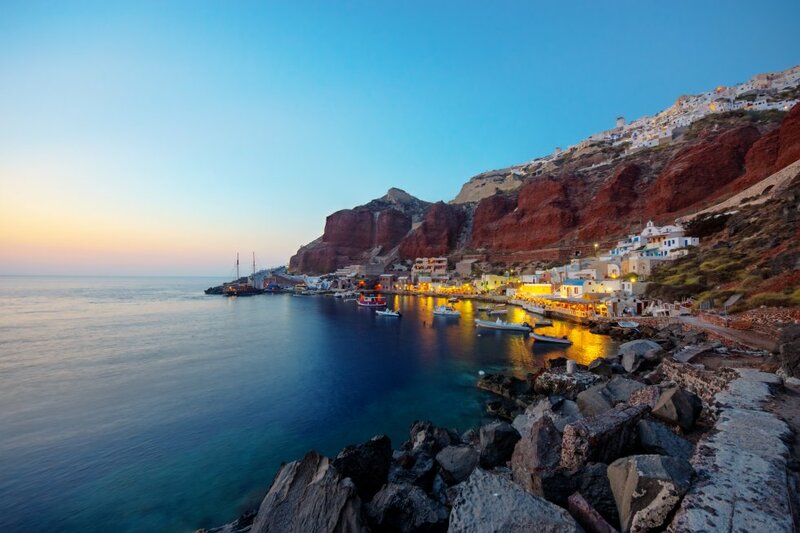 Some enjoy the day by taking a donkey ride down from Oia to Ammoudi where they swim, eat and then return back to Oia to take in one of the world’s famous sunsets. Others explore Oia’s local souvenir shops or visit some of the local artists whose display their work of the landscape. 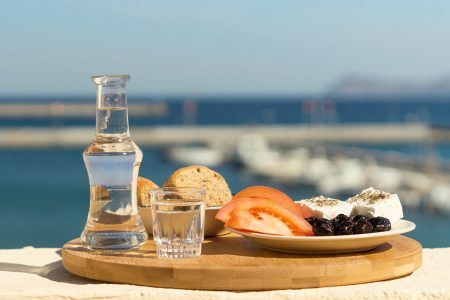 What better way to end your stay in Greece, by dining at one of the local restaurants we recommend with those majestic views. Your Hellenic Holidays transfer representative will drive you to the airport for your short flight to Athens connecting to your flight home. Note: The itinerary we have created above is flexible and can be tailored along with the destinations and activities offered. It represents a sample of the many alternatives that we offer. Customize this Journey: If you would like to customize this itinerary and create a Tailor-Made Journey for you and your companion, please e-mail us or speak to your favorite travel professional.